After years of evolution, testing, and iteration, the design team at Kamanu Composites came up with the Pueo. It's round hull, elongated rocker profile, plumb bow, and reserve buoyancy work together to create inarguably the best all-around canoe in existence. While other canoes may be faster in the flat, or better on a big downwind day, nothing can compete with the Pueo in all conditions. But, we don't expect you to listen to us. Do your own research, check race results, ask your friends, and, most importantly, call us to get on the demo. The Original Pueo was launched in 2008. After four successful seasons and three Moloka'i Solo victories, it was rebuilt from the ground up and re-released in early 2013. All the best features were kept, and some subtle new features were added. Changes include a forward shifted cockpit, slightly increased reserve volume, smoother rocker, a streamlined hull, higher footwell rails, front bungees, a more balanced feel, and an entirely re-designed ama. The 2nd generation Pueo has won the last three consecutive Moloka'i Solo World Championships, making it the canoe of choice for the world’s fastest paddlers. In 2016 we introduced a new hull known as the Pueo X and a forward footwell option for both the Pueo and Pueo X. We now offer four versions that suit different sizes and weights. Click here for more information on the design process for the new hull. The design of the Pueo is unique in that it's incredibly versatile. It's both efficient in flat water and easy to surf. The canoe is suitable for a wide range of paddlers from 100 lbs to 250 lbs and from 5 feet tall to 6'6". It almost seems impossible, but it's a design that works for just about anyone in any conditions. While the Pueo is the most versatile canoe that we build, the options below may be more suitable for a narrower range of body types. We have extended the cockpit forward 2.5", making this Pueo suitable for taller paddlers. It's recommended for anyone over 6'2" and 190 pounds. The Pueo X is an extended waterline version of the Pueo and is designed to improve performance in all conditions. However, due its reduced rocker profile it is much more sensitive to weight and trim, making it the right choice only for certain sizes and weights. It is ideal for paddlers under 190 pounds. See the sizing chart below to check if the Pueo X will be good for you. Because the Pueo X is sensitive to trim, and trim can be affected by both height and weight, the forward footwell version of the Pueo X is suitable for a wide range of paddlers-- from 5'7" and 130 pounds, to 6'3" and 180 pounds. It is identical to the Pueo X, but the footwell is moved forward 2.5". 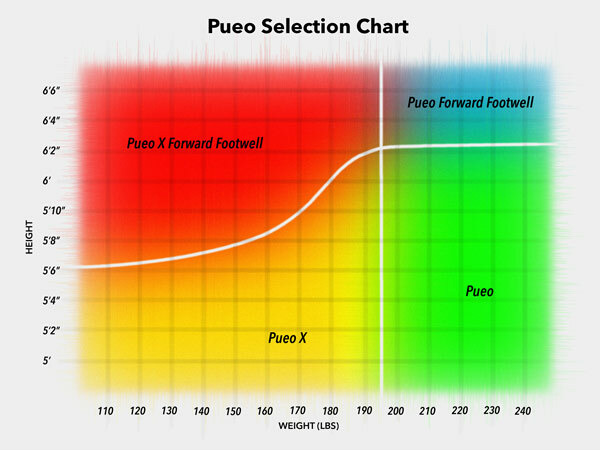 See the sizing chart below to check if the Pueo X with a forward footwell will be good for you. There are two ways to purchase a Pueo: Off-the-shelf canoes are available for purchase for anyone around the world. A current listing of available canoes is continuously updated at the Kamanu Store. Canoes start at $4800 and vary by lay-up and spray job. We often sell blemished canoes through the Kamanu Store at a steeper discount. Custom canoes built for you are available by a waitlist. Custom canoes start at $4900 and vary by lay-up and spray job. To place an order, click the link below. A $1000 deposit must be made at the time of order. Spray jobs are limited only by your imagination and our ability to spray. Abstract designs are ok, complex designs may need to be simplified. We can spray up to five colors on a canoe. Webbing, splatter, clear, and pearl type designs are all ok. Fades, pearl, and hard lines on the hull are possible, though not recommended. Clear on the deck is possible, but not on the hull. You also have the option of either stainless steel or polymer cable. Any design that takes more than fourteen hours to spray or requires the use of of our CNC machine to cut out a custom stencil (like scales, diamonds, checkers, etc) will cost an additional $200. This canoe is guaranteed to weigh under 19.5 lbs. It's an all carbon elite lay-up with carbon foot pedals and polymer cable, and it only comes in solid grey.